While sorting through my collections I've come across some fun items I'll be sharing here. 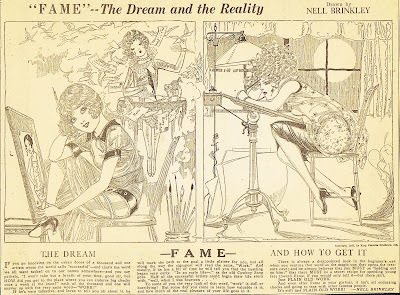 From a lot of clipped newspaper illustrations and comic strips I scored some fifteen years ago, comes this great Nell Brinkley cartoon about fame and the life of an artist. As true today as when it was written and drawn in 1927. Click on it to see, and read, a larger version.